Get to learn more about their experiences and love of everything orange. We’re just 2 short weeks away from the UMACC Spring Meeting at the McLeod County Fairgrounds Toy Building. My father was a lifelong enthusiastic supporter of Allis Chalmers machinery. Born and raised near New Ulm, MN, my childhood learning experiences included “driving” the C, WC, WD, WD45, D17, cultivating & plowing. When my father passed away, I was just 20 years of age. It left me almost totally unprepared with unforeseen farming responsibilities. Taking over the dairy farm included several first-time experiences; planting and harvesting corn, small grains, making and baling hay, etc. eventually leading to my first experience with a pull type combine –either a Model 60 or 66! 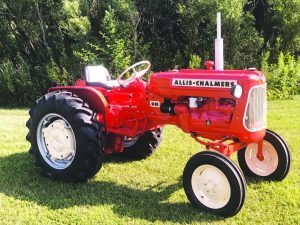 Though now retired from farming, we’re still living on the farm enjoying our collection of Allis Chalmers Tractors D10, WD, 175D and 185 and other pieces of farm equipment, along with an increasing collection of Allis toy tractors, etc. Show in Canada, leading to several other shows, tractor caravans, and a membership in the Upper Midwest A-C Club ™. Shortly thereafter, I volunteered to help with the set up and take down of the Orange Spectacular® annual shows at Hutchinson, MN. Though volunteering with the Hutchinson AC shows conflicted with AC Tractor caravans, I’ll always remember those caravans as one of the most relaxing and awesome life experiences driving thru the countryside with my AC Tractor. The friendship, fellowship and enjoyment with other lovers of Allis Chalmers tractors created many a memory! My wife, Arlene, and I have two married sons, a daughter, nine grandchildren and two great-granddaughters, who have always enjoyed and continue to be very supportive of all my involvements with The Upper Midwest A-C Club™, along with all related Allis Chalmers shows and functions. I believe my past experiences will continue to be a strong asset to the club. It would be an honor to continue serving as a dedicated Director/Board Member for the membership of the Upper Midwest A-C Club™. Your vote of confidence and support would be most appreciated. I am Darrell Grams Sr of Green Isle MN and have been a member of the UMACC for the past 20 years. I and Shirley have been married for 52 years, have 5 children, 13 grandchildren, and 4 great grandchildren. All of our children and many of our grandchildren have been actively involved in activities at the Orange Spectacular on a yearly basis. I was first appointed to the UMACC in 2015 to fill the unexpired term of Larry Karg. In 2016, I was elected to serve on the Board of Directors and was elected President by other board members. In 2017, because of personal matters with Shirley and I having some Health issues, I stepped down as President , however I was then elected Treasurer by the Board. I have continued in that position and have decided to seek another term on the UMACC Board of Directors. I would look forward to the continued support I have received from the UMACC members over the past 4 years.